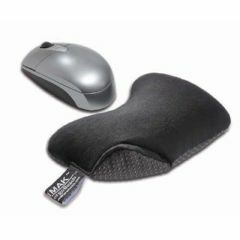 The Non-Skid Mouse Cushion offers all of the same benefits as the original, with the added benefit of a non-skid bottom to keep it in place. The ergoBeads filled mouse cushion offers a comfortable support for your wrist while using a mouse. The unique design offers a larger opening for your hand to maneuver the mouse, while completely supporting your wrist and forearm in an ergonomically correct position. The ergoBeads massage your wrist as you move with the mouse, providing all day mousing comfort. Texture. Good Value. Safe. Lightweight. Sturdy. just enough support. just enough support. odd spaced set-ups. non-traditional support. Texture. Lightweight. Attractive Design. Good Value. could be a little bigger. Size. Texture. Attractive Design. Good Value. Safe. Sturdy. Lightweight. This has a really nice feel to it. The material is very soft. I am thinking about getting the wrist rest too. Size. Texture. Good Value. Lightweight. Sturdy. Comfortable. Eases wrist pain. Skids and slips off desk. I do heavy data entry and have carpal tunnel pain in my wrists as a result. The Imak ergoBeads non-skid mousepad eases the pain in the bottom of my wrist. It is very helpful to me to have this support while mouse clicking. Its size makes it easy to use with a mouse. The only drawback is it tends to slide off the desk onto the floor, so it is not very non-skid. what are the measurements for the non-skid mouse pad?